I made placenta prints two days after Dio's birth. The ones on the top of the picture were done with the blood from the placenta, then I rinsed it off and painted it with watercolors. I think I'll frame the watercolor print on the bottom left, like I did with Zari's placenta print. It seems my placentas like to be distinctive. Zari's placenta had a velamentous cord insertion. Dio's had a battledore or marginal cord insertion--not as rare as a velamentous insertion, but interesting nonetheless. A battledore placenta has an umbilical cord that attaches at the edge of the placenta, rather than the middle. Why the name battledore? According to several sources, battledore placentas resemble the racket used in battledore, a precursor to badminton. YAY! These turned out great. This makes me want to send you my own; or at least dig them up from my stack of art to be framed and display them here, or at our local birth center. Fabulous! You express your passion for birth so well in this art! 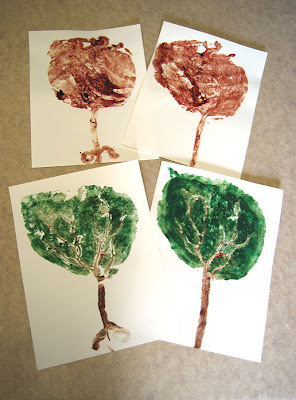 How funny that your print turned out to look like a tree after your belly was painted like a tree! The one you plan to frame looks just a bit heart-shaped. Really nice! So cool! These are really fantastic--and the battledore insertion really does make for a nice tree-print. I like the botton right one the best. Interesting that you have had 2 very different placentas. 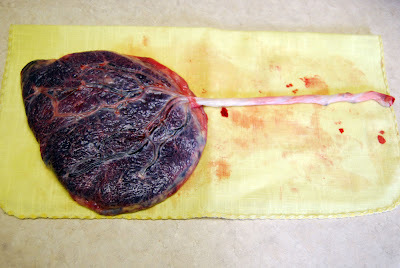 Because most of the placentas I see are the usual cord stuck in the middle, run of the mill placenta. Cool! I like how it is a tree this time. I also like the two pics on the right of your blog now! So cute! This is so neat! I think I will try this when I have another baby! Is this a joke? GROSS!!! Grosser than gross! Oh, these are so beautiful! And, what special placentas you have!